Discoveries of stone, clay, and bronze relics give evidence of an ancient settlement in the area. Five trade routes once converged in the valley, contributing to the rise of the nearby town of Judenburg, the “capital” of Upper Styria. The area has always been famed for its iron ore, with medieval knights demanding it for their weapons. Prosperity didn’t last forever though: trade routes shifted; Hungarians and Turks invaded; the Black Death descended. Several different noble families have owned the castle over the centuries. The name Gabelhofen comes from a Bavarian gentleman who purchased the castle in 1596. There’s lots to do in the area. On the regional road to Graz at Gestüt Piber, you’ll find the stud farm of the extraordinary Lipizzaner stallions before they’re shipped off to the famous Spanish Riding School in Vienna. In the other direction at Murau, a charming steam train makes a 5-hour excursion through the picturesque Mur Valley. Throughout the valley, tiny villages with medieval origins suggest an Austria from a hundred years ago. Fohnsdorf is about 80 km northwest of Graz. It takes a little more than an hour by car (the best way to get there). The nearest rail station is in Judenburg, just a few km away. No chapel, but the hotel has a special salon for the registry office ceremony. In the heart of Styria amid alpine ranges and river valleys, Schloss Gabelhofen offers 4-star luxury in an area relatively unknown to international tourists. You won’t find tattered carpets and family heirlooms sitting about; this hotel has undergone extensive renovation and modernization. Rooms are individually decorated and configured according to the castle’s architecture. Schloss Gabelhofen is a lovely Renaissance castle ideal for conferences, seminars, and weekend getaways. 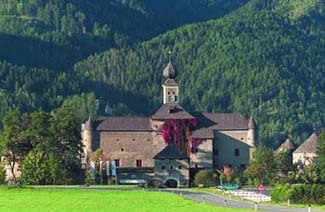 For the casual visitor, the schloss makes a convenient base from which to explore the area.